Thunderstruck II is a 5 reel, 243 ways to win slot game with a 96.65% RTP. You can get up to 25 free spins with a Rolling Reels. Thunderstruck II slot game like its predecessor is an adventure and magic themed slot game. This slot game has 243 payline or winning combinations and five reels and is a more advanced version of the Thunderstruck game. This slot game offers players four different features which are exciting and at the same time highly rewarding. Thunderstruck II has an advanced gameplay and a quality sound effects that is more appealing than that of the original Thunderstruck. This game comes with a paytable achievement feature where players can unlock all locked symbols by carefully completing all paytable for all sections on the UK slot game. One of the symbols of this game is the Thunderstruck II logo which is used to represent the wild symbol. This wild symbol can substitute all symbols on the slot game. Another great feature is great Hall of spin feature which will give players free spins. 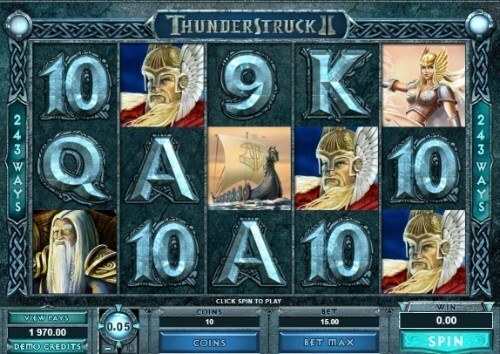 Microgaming is the developer of the Thunderstruck II slot game. With over 850 games, this game provider is world famous. To further show that it is innovative, this gaming platform develops games that are compatible with multiple devices. Some games developed by this platform includes; Jurassic Park, Immortal Romance and Hot as Hades. One game that undeniably shares the same graphics and theme with the Thunderstruck II slot game is its predecessor Thunderstruck slot. These games are adventure themed slot game, the only difference between these games is that the Thunderstruck II is a more advanced game when it comes to entire graphics, sound effects and overall gameplay. Another game that has a similar theme to the Thunderstruck II slot game is the Scrolls of Ra slot game. Both games are adventure themed slot games. These two games come with impressing sound effects and designs. Wildstorm is randomly triggered on any spin. This randomly changes up to 5 of the reels completely wild, unlocking the potential for EPIC wins. Thunderstruck II slot game offers players world class gaming experience with massive rewards and bonuses. For players to get into the hall of spins, they will have to discover three of Thor's hammer on any of the reels. This slot game has amazing bonus features. The Valkyrie bonus is one of the bonus features of the slot game. To trigger the Valkyrie bonus, players will have to gain entry into the hall of spins. To get access to the hall, players will have to land three or more of Thor's hammer. The Valkyrie bonus gives each player ten free spins and five times multiplier. Gaining multiple entrances to the hall of spins will offer players more bonus features. Another bonus feature is the Loki bonus. This bonus feature will be triggered or activated when players are either on their fifth or ninth free spin bonus. If activated, players will get the wild magic feature as well as fifteen free spins. This wild magic feature transforms symbols on the Thunderstruck II game into wilds. The Odin bonus is another feature of the Thunderstruck II slot game. This feature is triggered when players get to either the tenth or fourteenth stage of the free spin bonus feature. When activated, this feature gives each player twenty free spins and also Odin's wild raven. This raven will automatically turn random symbols into three times and two times multiplier If as a player you are lucky enough and Odin's two ravens appear on any reel at exactly the same time, you get six times multiplier. Another feature is Thor's bonus which is triggered on the fifteenth free spin. This feature offers players the rolling reels bonus feature as well as 25 free spins. This rolling reels bonus feature immediately turns consecutive wins multipliers to five times. The rolling reels offer players the opportunity to win consecutively. One game that has a similar feature with the Thunderstruck II slot game is the Double Wammy slot game. Like the Thunderstruck II, the Double Wammy slot game comes with the multiplier feature, a free spin bonus feature as well as other symbols like the wild and scatter symbol. Avalon happens to be another slot game that is similar to the Thunderstruck II slot game when it comes to its features. Like the Thunderstruck II, the Avalon slot game comes with the multiplier and the free spins bonus feature. Also, it comes with the wild symbols, the scatter and other lower value symbols. Also developed by Microgaming, this slot has a return to player percentage of 96.1%. There is no clear difference between the mobile version of the Thunderstruck II slot game and the desktop version. This is so because of the dedication of the team of developers to ensure that players all around the world get the same gaming experience when playing their games. Players will find it interesting to know that they can play this slot game on the Money Reels online platform with either their mobile or desktop device.